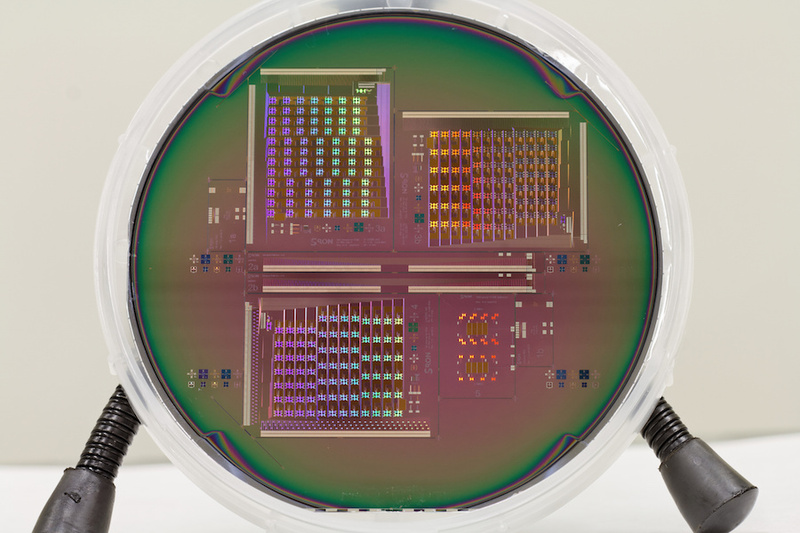 Chip with 160 pixel TES bolometer array. This infrared radiation detector chip was used for development of the FDM readout technique. 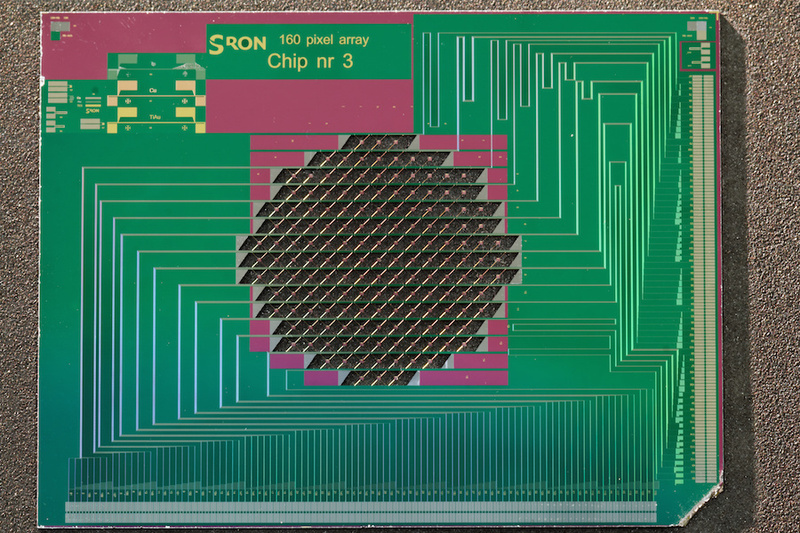 Each pixel has an equal length of wiring to the wire bonding pads on the edge of the chip. Wafer with LC filter chips. The chips on this wafer contain 160 LC resonators each (coils and capacitors) as components in a Frequency Division Multiplexed readout system. Wafer with immersed grating pattern. For the SRON Earth scientific line, we currently contribute in the development, calibration, and operation of spectrometers for (greenhouse) gas atmospheric missions like ESA's Sentinel-5 mission, and its precursor TROPOMI. For aerosol characterization, we develop and exploit spectro-polarimeters in the SPEX project. For the Astrophysics programme we apply management, systems engineering, and X-ray instrumentation expertise in e.g. the Soft X-ray Spectrometer (SXS) of JAXA's Astro-H mission and the X-ray Integral Field Unit (X-IFU_ of ESA's Athena mission. For the Astrophysics science line, sensitivity of the space instrumentation is the key driver. SRON's instrument scientists develop cryogenic detection techniques for the space instruments of Athena/X-IFU and SPICA/SAFARI. Design, modelling, fabrication in our clean room, testing, and analysis activities are performed. Current research is focused on bolometers and calorimeters based on Transition Edge Sensors (TESs) and associated multiplexed readout components for multi pixel arrays. In addition, superconducting hot electron bolometer mixers and quantum cascade lasers, for heterodyne detection at terahertz frequencies, is prepared for NASA balloon-borne astronomical telescopes at terahertz frequencies, such as STO and GUSTO. Much of this heterodyne knowledge is based on our Herschel/HIFI technology. The work for the HIFI instrument included systems engineering, project management, detector development and Assembly, Integration, Verification (AIV) of the final instrument. The ISG also has a long tradition in delivery of THz and sub-mm instrumentation for ground based observatories like JCMT in Hawaii and APEX in Chile. Also a large sub-mm camera based on Kinetic Inductance Detectors (KIDs) was developed and installed on the APEX telescope. This in close collaboration with the SRON Technology group. The Instrument Science group is subdivided in four sections, OptX, Litho, Cryo Utrecht and Cryo Groningen reflecting the main disciplines and geographical locations. The OptX section contributes in the development of enabling technologies for earth-observation and the development, operation, calibration, systems engineering and project management of optical and X-ray instrumentation, for Earth- system science and astrophysical research. The Litho section uses deposition, patterning, and analysis equipment in SRON's and various other (Dutch) clean rooms for development of micro-fabrication processes, to be applied for research and space-qualified fabrication of cryogenic detector systems and optical equipment for space instruments. The section maintains, tailors, and expands the equipment in SRON's ISO class 5/6 clean room. A complete overview can be found here. The Cryo section in Utrecht is currently working on the designs, modeling, and tests of transition-edge sensors as bolometers for far-infrared wavelengths and as calorimeters for X-ray detection. The Groningen Cryo section both develops detection techniques, as well as the instrumentation based on these principles. Many of the instrument scientists have project management experience with volatile R&D projects, or with instrument development for ESA, JAXA or NASA missions, sometimes with industrial collaborations. The project managers have Prince2 or IPMA certifications. The innovative and complex nature of the instruments being developed by SRON requires a solid systems engineering practice. The ISG system experts apply the ECSS standards. Regular INCOSE trainings ensure this knowledge attitude is kept active.